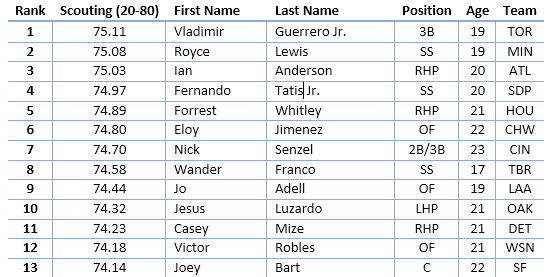 Version 22.00 of Baseball Mogul 2019 (released on March 21st) includes about 60% of the "Top-10" prospects for each team. The other 40% were omitted were several reasons. One is that I was using "Top-100" prospect lists, which is only about 3 players per organization. Another is that I can't yet include players without any playing time in either the major or minor leagues (e.g. Victor Victor Mesa and Marco Luciano). The good news is that Version 22.01 adds 126 more players from MLB.com's list of top 10 players in each organization (see file). Thanks to some help from Mogul fan Damian Henning, Version 22.02 should include about 15 more "Top-10" prospects, leaving less than 3% of this group missing from the database. Baseball Mogul 2018 introduced a feature that searched the web for official team logos and major league player photos, automatically downloading them for use in the game. Baseball Mogul 2019 takes this to the next level by adding 52,000+ active and historical minor league players. The screen shot above shows a tiny sampling of the photos downloaded during beta testing.